Ubisoft doesn't stop working on Assassin's Creed franchise, and today we have got new facts to prove it. Thus, the Assassin's Creed 4 DLC - Freedom Cry - has got the supposed release date, the next update for PC-gamers is already available and new fan video has been published. 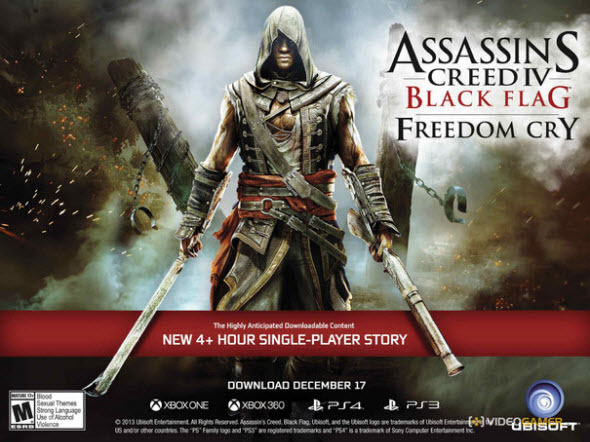 Freedom Cry DLC - the first upcoming add-on of Assassin's Creed 4 - has got a poster, on which its release date is presented. The advertisement claims that DLC is coming on the 17th of December, but only for the current and already old generations of consoles. Whether the PC version of Freedom Cry DLC will be released on the same day, remains unknown. We would like to remind you that the first Assassin's Creed 4 DLC will bring a full-fledged and exciting single-player campaign, in which you will be trying to liberate the slaves. Although PC gamers won't be able to play Freedom Cry on the 17th of December, already today they can download the latest Assassin's Creed 4 update. This patch fixes many bugs that have been noticed in single-player and multiplayer modes of the game. Inter alia, the update solves numerous problems with graphics, animation and stability. To find the release notes, follow the link. And at the end of the article we would like to present you the magnificent fan video that describes the beauty of Assassin's Creed 4. Enjoy!